Spiral galaxies are usually very aesthetically appealing objects, and never more so than when they appear face-on. 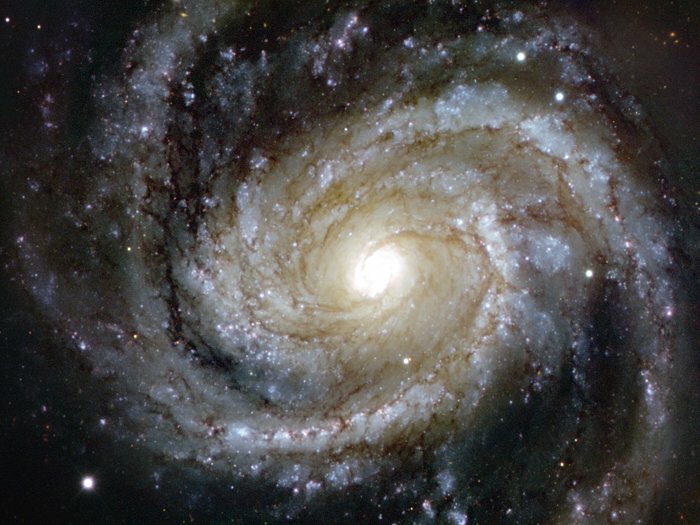 And this image is a particularly splendid example: it is the grand design spiral galaxy Messier 100, located in the southern part of the constellation of Coma Berenices, and lying about 55 million light-years from Earth. 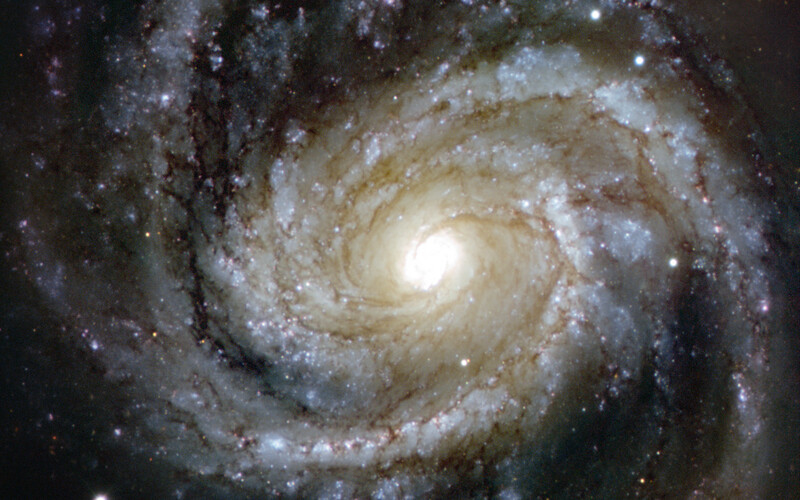 While Messier 100 shows very well defined spiral arms, it also displays the faintest of bar-like structures in the centre, which classifies this as type SAB. Although it is not easily spotted in the image, scientists have been able to confirm the bar’s existence by observing it in other wavelengths. This very detailed image shows the main features expected in a galaxy of this type: huge clouds of hydrogen gas, glowing in red patches when they re-emit the energy absorbed from newly born, massive stars; the uniform brightness of older, yellowish stars near the centre; and black shreds of dust weaving through the arms of the galaxy. 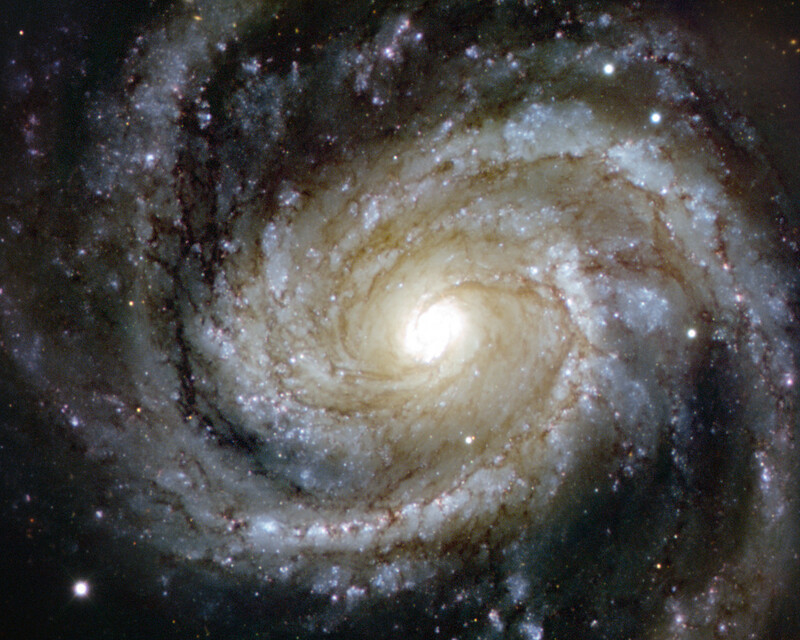 Messier 100 is one of the brightest members of the Virgo Cluster, which is the closest cluster of galaxies to our galaxy, the Milky Way, containing over 2000 galaxies, including spirals, ellipticals, and irregulars. This picture is a combination of images from the FORS instrument on ESO’s Very Large Telescope at Paranal Observatory in Chile, taken with red (R), green (V) and blue (B) filters. Position (Dec): 15° 49' 20.11"